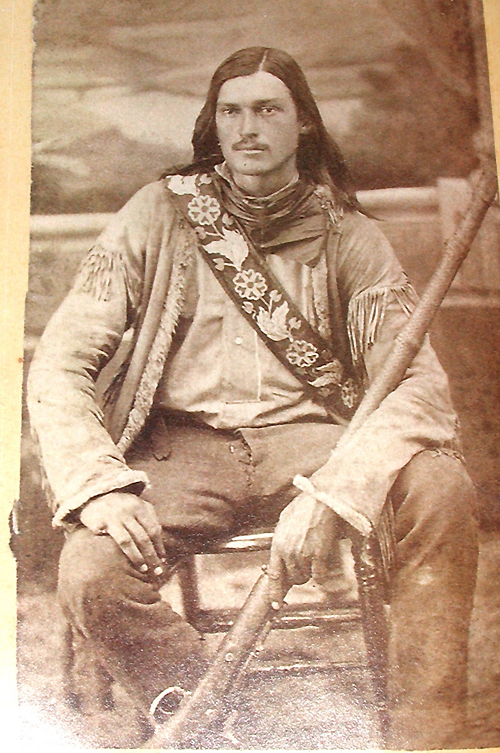 Luther “Yellowstone” Kelly was a real frontier trapper and scout, whose particular expertise and knowledge was in the Montana area from which he got his nickname. He served as the chief of scouts for Gen. Nelson A. Miles in the Yellowstone district during the Sioux wars of 1876-1877, the same time period as this movie. He was not, as the prologue of the movie would have it, the first white man to cross the Yellowstone Valley. He was more than thirty or forty years too late for that. Some of Lewis and Clark’s party had gone down the Yellowstone Valley even seventy years earlier on their return from the west coast. 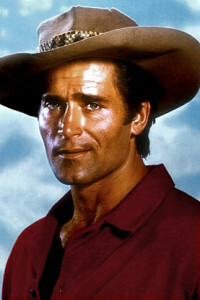 In this version, Kelly (Clint Walker) rides into Fort Buford (at the confluence of the Missouri and Yellowstone rivers on the western border of North Dakota) to replenish his supplies. Custer’s defeat at the Little Bighorn has already happened, so this is after June 1876. While at Fort Buford he advises inexperienced but ambitious Major Towns (Rhodes Reason) against his plan to hunt the Sioux and refuses to go with the cavalry. He ends up fighting with several soldiers, led by a sergeant (Claude Akins), and he acquires Anse Harper (Edd Byrnes) as a kind of unwanted apprentice. Clint Walker as Kelly and John Russell as Gall; and Ray Danton as Sayapi. As Kelly and Harper ride into the Snake River country with their two supply mules, they encounter hostile Sioux, who capture them. They are taken to Gall (John Russell), chief of the Hunkpapa Sioux. It develops that seven years earlier Gall had been shot on the Snake, and Kelly had cut out the bullet and healed him without knowing who he was. In return, Gall has allowed Kelly to trap the Snake country for seven years. 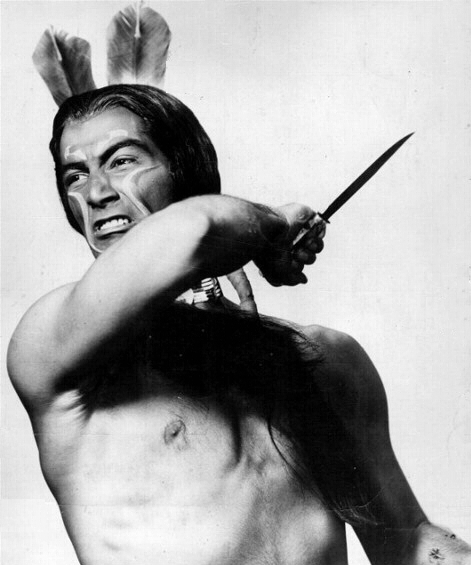 Now he wants Kelly to remove a bullet from another Indian—from a captive Arapaho maiden, Wahleeah (Andra Martin). A complication is that Wahleeah’s captor is Gall’s nephew Sayapi (Ray Danton), who does not trust Kelly. Kelly is successful in removing the bullet; in return Gall allows Kelly and Anse to leave with their mules. As they move into Kelly’s cabin and set up traps, they see an Indian rider approaching and then fall off his horse. It’s Wahleeah, who has escaped from Sayapi and is now all but dead. As she lies recovering, Gall rides up and decides she can stay the winter with Kelly and he will retrieve her when he returns from his winter hunting ground. An angry Sayapi breaks with his uncle and rides off with a few followers. 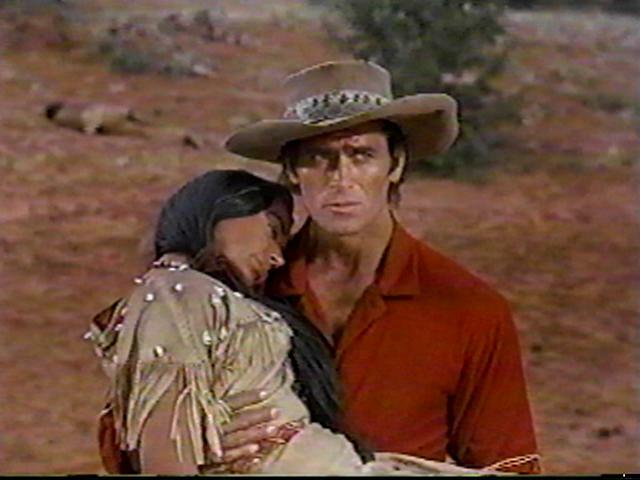 Kelly (Clint Walker) rescues Wahleeah (Andra Martin). Wahleeah (Andra Martin) talks the impressionable Anse (Edd Byrnes) into letting her escape. Kelly and Wahleeah ride back to home ground, but are soon overtaken by the remnants of Major Towns’ column. The major is dead, and the column and Kelly are soon surrounded by Gall and his warriors. Gall offers to let Kelly depart in peace if he gives up Wahleeah, but Kelly refuses. After a couple of attacks demonstrate that the column is likely to be wiped out, Wahleeah breaks for the Sioux. When she falls, Kelly and Gall meet over her, and Gall makes the same offer again. But finally he recognizes that Wahleeah has chosen Kelly, and he departs in discouragement or disgust. Kelly and Wahleeah ride off together. The screenplay for this movie was written by Burt Kennedy, then in the middle of his fruitful collaboration with Budd Boetticher and Randolph Scott. It was originally intended for John Ford to direct, with John Wayne starring as Kelly, but they opted for The Horse Soldiers instead. Several of the principal actors were under contract to Warner Bros. for television series: Clint Walker in Cheyenne, Edd Byrnes in 77 Sunset Strip (known more for his hair than for his acting), John Russell (Lawman) and Ray Blanton (The Alaskans). Walker even rides Brandy, his big horse from the Cheyenne series. 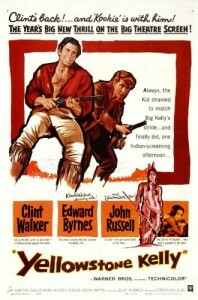 This is Clint Walker’s best-known western, but not the best. 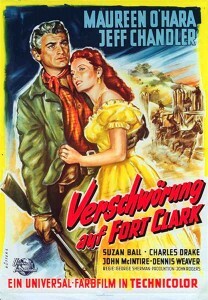 That would probably be Fort Dobbs, made the previous year, also with director Gordon Douglas. 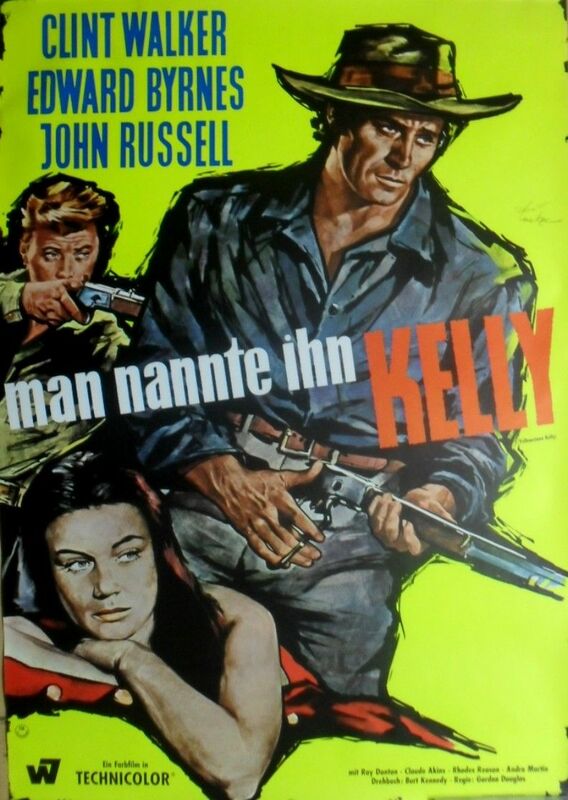 John Russell made this the same year he played bad guy Nathan Burdette in Rio Bravo, with John Wayne. The shifty Ray Danton had played Blackie in The Spoilers before moving into television work. Blue-eyed Andra Martin was a Warners starlet, and this may have been the high point of her movie career. Warren Oates has a non-speaking role as a trooper who gets killed. You have to look fast to catch him. 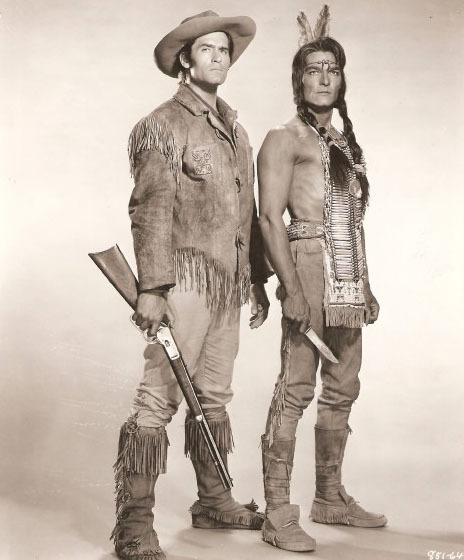 Clint Walker as Yellowstone Kelly; and the real Luther Kelly during his scouting period in the 1870s. There are several problems of geography and tribal history with this story. Fort Buford was in far western North Dakota, and the Snake River rises in southwestern Wyoming, hundreds of miles to the west across the wide breadth of Montana, and never even makes it into Montana before heading west across Idaho. The Snake River and Yellowstone Park were not in Sioux country; the dominant tribe would likely have been the Shoshonis (or Snakes), although you could perhaps find Blackfeet or even Crows in the vicinity. But not the Sioux, who were enemies of the Shoshonis and Crows. The Arapahoes were not enemies of the Sioux but were, like the Cheyennes, traditional allies of the Sioux. Still, if you like Clint Walker, this is a watchable western with kind of a meandering plot and a seductive blue-eyed Arapaho maiden. In color, at 93 minutes. 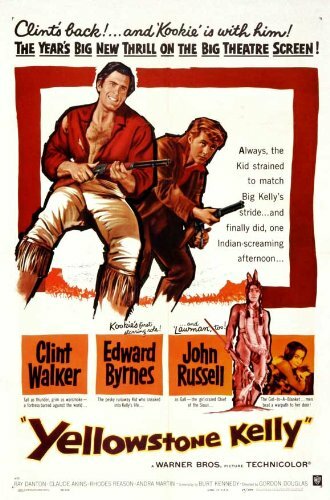 This entry was posted in Westerns Worth Watching and tagged Burt Kennedy, Cavalry Westerns, Clint Walker, Frontier Doctors, Native Americans (Indians) on October 31, 2014 by Nicholas Chennault. The young Wyatt Earp at age 21, taken about 1869, probably in Lamar, Missouri; and Kevin Costner as the young Wyatt Earp, in Wyatt Earp (1994). 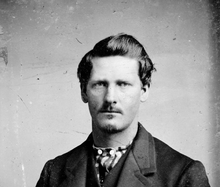 Wyatt Earp, now an icon in western history, fiction and film, came late to that position. Many in Hollywood had known the aging Wyatt Earp, who had died in 1929 after a few years of working as an adviser on western films there. He had moved to Hollywood in 1915, and may have been introduced to John Ford by western star Harry Carey. 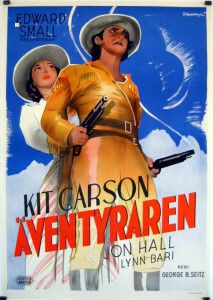 John Ford claimed to have known the old man, to own his rifle and to have gotten the version of the OK Corral gunfight shown in My Darling Clementine from Wyatt. (The last claim does not appear to be correct; the versions in both Tombstone and Wyatt Earp are much more accurate, according to what is known historically.) Blake Edwards’ movie Sunset is based on Earp’s Hollywood years, although it shows a younger and physically more active Earp than the old man actually was at that time. At the time of his death he was much more remembered for his controversial role as the referee in the Fitzsimmons-Sharkey prize fight in San Francisco in December 1896 than he was for participation in the gunfight in Tombstone in 1881. He died in January 1929 at his home in Los Angeles; he was the last surviving Earp brother and the last living participant in the famous gunfight. The pallbearers at his funeral included old friend John Clum, the former editor of the Tombstone Epitaph, and Hollywood cowboy stars William S. Hart (then retired) and Tom Mix (then still active). 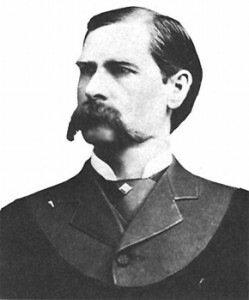 In his current image as courageous lawman and gunfighter, Earp was largely re-introduced to the American public by a quasi-biography, Wyatt Earp: Frontier Marshal, by Stuart N. Lake. This book was an extremely flattering and largely fictional bestseller published in 1931, two years after Wyatt’s death. Josephine Earp tried to get herself and Mattie Blaylock left out of the book, and wanted Wyatt depicted as a teetotaler, which he was not. Lake was the first to refer to “the Buntline special” as Wyatt’s gun; in fact, it appears not to have existed. 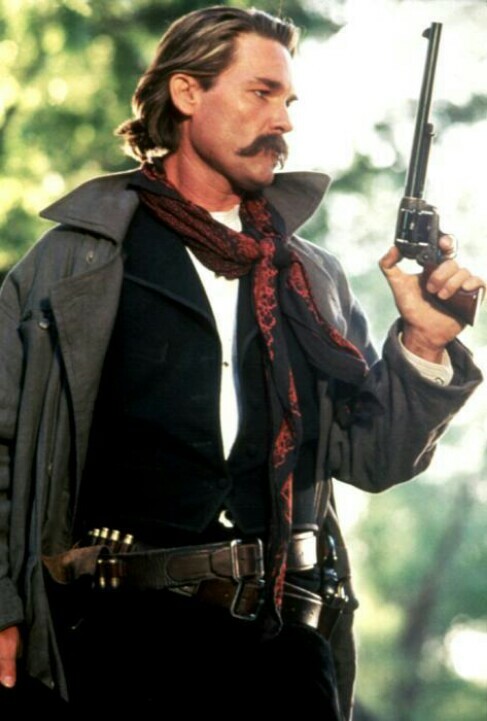 Wyatt Earp in his prime, in 1889, a few years after Tombstone; and Kurt Russell as the Tombstone Earp, in Tombstone (1993), with the fictional Buntline special. 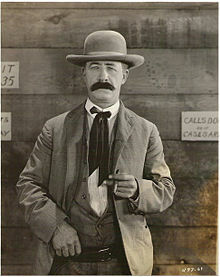 Wyatt’s first appearance in film was as an incidental character in William S. Hart’s Wild Bill Hickok (1923), played by Bert Lindley. Movies with Wyatt in a more central role picked up after the publication of Lake’s book, beginning with Law and Order in 1932, in which those taming Tombstone are named Frame ‘Saint’ Johnson (Walter Huston) and Ed Brandt (Harry Carey), rather than Wyatt Earp and Doc Holliday. It features the first cinematic treatment of the famous gunfight. 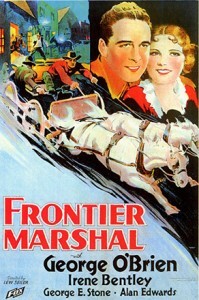 Frontier Marshal followed in 1934. Due to arguments and lawsuits with Josephine Earp, some of the names were changed, and George O’Brien plays “Michael Wyatt.” This film is now thought to be lost. The Earp story really became part of the Hollywood mainstream in 1939, with Randolph Scott as Earp, and it has been present ever since in one form or another. By late 1960s (Hour of the Gun) and 1990s (Tombstone, Wyatt Earp), some of the less savory aspects of Earp’s life, like the Earp brothers’ irregular relationships with women and the quasi-outlaw aspects of Wyatt’s vendetta ride, began to be treated more openly. Unlike other characters and incidents from actual western history, the Earp story has given rise to an unusual number of good westerns, of which six are recommended below. 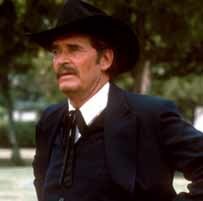 Wyatt Earp in 1928, during his Hollywood period as he nears 80, still with more than a hint of flintiness about him; and James Garner playing Wyatt Earp during his Hollywood period in Sunset (1988). 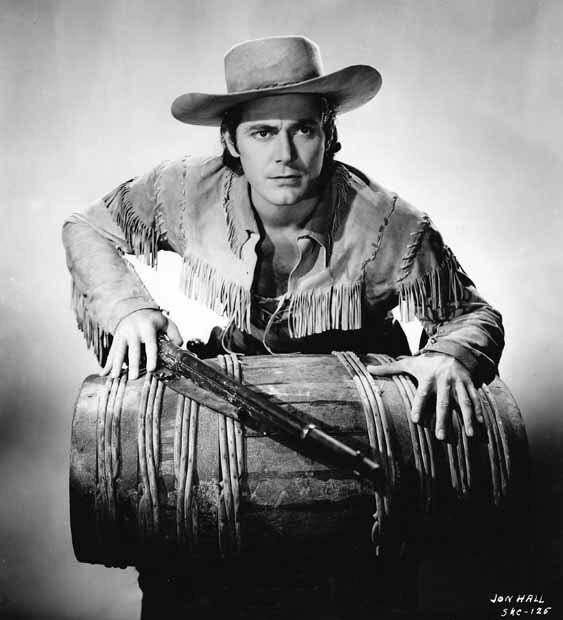 Wild Bill Hickok–Hart (1923): In Wyatt’s first appearance on film, he is played by Bert Lindley as an incidental character in the larger story of Hickok, played by William S. Hart. Law and Order—Huston, Carey (1932; Dir: Cahn): Written by John Huston, this features the first example of the OK Corral gunfight on film, albeit with the leads Walter Huston and Harry Carey (in a top hat) using other names: Frame “Saint” Johnson and Ed Brandt. This is sometimes available on YouTube. It was Carey’s 97th western (he started in 1910), and he had a few more to go. Frontier Marshal—O’Brien (1934): Silent star George O’Brien, who subsequently shows up in many John Ford films in character roles, here plays “Michael Earp” or “Michael Wyatt” in a film now thought to be lost. 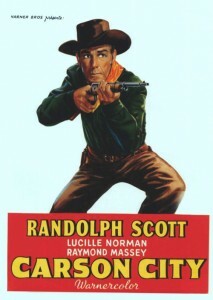 Frontier Marshal—Scott (1939): The first of the modern versions of Wyatt Earp in Tombstone features Randolph Scott as a Wyatt with no brothers and Cesar Romero as a credible Doc Holliday. Tombstone: The Town Too Tough to Die—Dix (1942): An aging Richard Dix as Wyatt Earp, with Kent Taylor as Doc Holliday. Edgar Buchanan as Curly Bill Brocious? My Darling Clementine—Fonda, Mature, Brennan (1946; Dir: John Ford): One of John Ford’s masterpieces, this features Henry Fonda as a superb Wyatt Earp. Characterized by beautiful black and white cinematography, dazzling use of Monument Valley and one of the most robust-looking tubercular dentists on film (Victor Mature). It’s not strong on historical accuracy, though. Winchester ’73—Geer, Stewart (1950; Dir: Anthony Mann): Will Geer plays Wyatt Earp as the judge in a shooting contest in Kansas early in the film. James Stewart is the main character hunting his brother in this excellent western that has almost nothing to do with Wyatt Earp. Masterson of Kansas—Cowling, Montgomery (1954; Dir: Castle): Bruce Cowling is a curiously ineffective Wyatt Earp during his Kansas years, playing a distant second fiddle to the wooden George Montgomery as Bat Masterson. Wichita–McCrea (1955; Dir: Jacques Tourneur ): An aging Joel McCrea plays the young Wyatt Earp in Kansas, before Tombstone. Director Tourneur and star McCrea usually make a good combination, but this isn’t their strongest outing. Gunfight at the OK Corral—Lancaster, Douglas (1957; Dir: John Sturges): A glitzy Hollywood treatment is given to Earp and Holliday in Kansas and Tombstone by excellent director John Sturges, featuring two of the biggest stars of the time: Burt Lancaster and Kirk Douglas. Cheyenne Autumn—Stewart (1964; Dir: John Ford) A very miscast and aging James Stewart is a quasi-comic Wyatt Earp during a misconceived interlude, showing that even a master like John Ford is not infallible. Hour of the Gun—Garner, Robards (1967; Dir: John Sturges): This is the better of director John Sturges’ two Wyatt Earp movies, with James Garner and Jason Robards both excellent as Wyatt and Doc Holliday. Doc—Yulin, Keach, Dunaway (1971; Dir: Frank Perry): A revisionist 1970s take on Earp and Holliday, not seen a great deal these days. Sunset—Garner, Willis (1988; Dir: Blake Edwards): This is a buddy-movie/mystery, focusing on Wyatt Earp’s days in the late 1920s as an adviser to Hollywood westerns. It features James Garner playing Wyatt Earp for a second time (after 1967’s Hour of the Gun), with Bruce Willis as his partner Tom Mix. Tombstone—Russell, Kilmer (1993; Dir: George Cosmatos/Kurt Russell): One of the very good recent retellings of the Tombstone story, with an excellent Kurt Russell as Wyatt Earp and Val Kilmer dazzling as Doc Holliday. 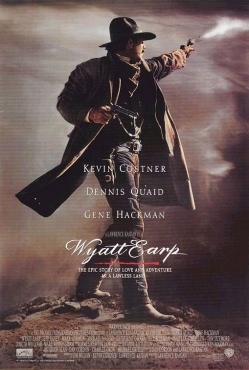 Wyatt Earp—Costner, Quaid (1994; Dir: Lawrence Kasdan): The most historically accurate retelling of Wyatt Earp’s story on film. Overlong and often slow, sometimes dour, this is nevertheless worth watching. 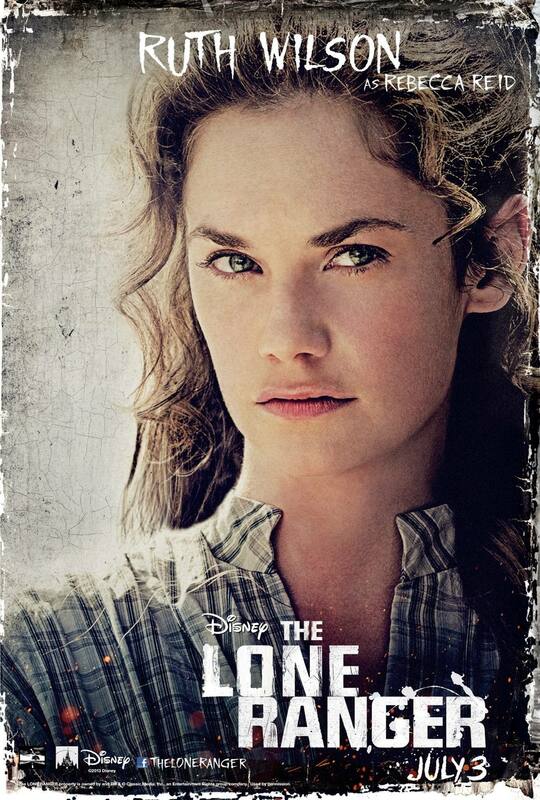 Hannah’s Law—Holt, Kennedy, Canning (2012; Dir: Rachel Talalay): This highly anachronistic made-for-television story of a female bounty hunter also features an anachronistic young Wyatt Earp and young Doc Holliday in Dodge City. Wyatt Earp’s Revenge (2012): A direct-to-video story, supposedly about the young Wyatt Earp. 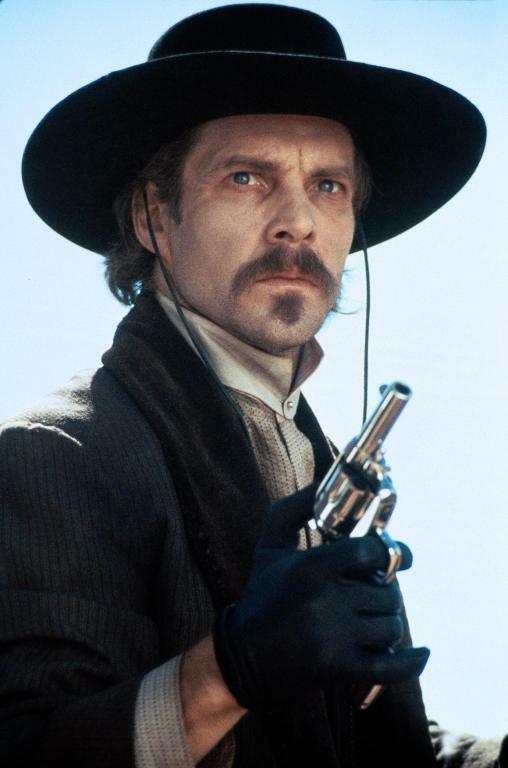 With Val Kilmer briefly playing an older Wyatt Earp, this makes him the only actor to have played both Doc Holliday (Tombstone) and Wyatt Earp (here). Bert Lindley as the first Wyatt Earp on film, an incidental character in Wild Bill Hickok (1923); and Kevin Costner as a more recent cinematic Wyatt in Wyatt Earp (1994). This entry was posted in Lists and tagged Wyatt Earp on October 29, 2014 by Nicholas Chennault. In the 1980s, director Lawrence Kasdan was riding high, with successful movies in a variety of genres: neo-film noir (Body Heat), Boomer nostalgia (The Big Chill) and even the deeply unfashionable genre of westerns, with Silverado. 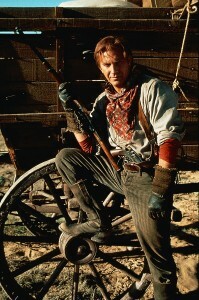 By the mid-1990s, Kevin Costner was at the peak of his acting/directing career, having appeared in Silverado and having directed and starred in Dances With Wolves, which accomplished the then-unthinkable—Best Picture and Best Director Oscars for a western, the first to be awarded a Best Picture Oscar in sixty years. 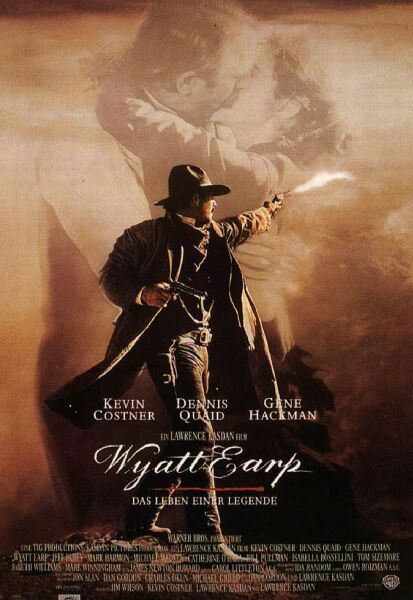 So if Kasdan and Costner were to join forces on another western, revisiting the ever-popular Wyatt Earp story, how could that be anything but great? It’s not a failure, exactly, but it did not turn out to be great. It was complicated by the fact that this was one of two Wyatt Earp movies in production at the same time. Tombstone, with Kurt Russell and Val Kilmer, was released first and turned out to be the better (and more enjoyable) western. Even without comparisons with Tombstone, Wyatt Earp feels overlong, sometimes turgid and dour. It is also perhaps the most accurate telling of the Earp story on film so far (although it has a few inaccuracies of its own), making it worth while to watch, and doubly so if you’re fond of the Wyatt Earp-Doc Holliday gunfight story. The first hour or more is spent setting up the story, and, although we haven’t seen a lot of this stuff before, it feels slow. It starts with a brief scene setting up the famous gunfight in Tombstone and then cuts to Wyatt’s childhood in Illinois during the Civil War. Oldest brothers James and Virgil are off at the war, and we see patriarch Nicholas Earp (Gene Hackman), a lawyer and farmer, instilling his own version of family values. “Remember this, all of you. Nothing counts so much as blood. The rest are just strangers.” After the war Wyatt spends some time out west, freighting in Wyoming and refereeing the occasional bareknuckle fight. Young Wyatt (Kevin Costner) freighting out west in Wyoming; and the tubercular dentist-gambler-gunfighter, Dr. John Holliday (Dennis Quaid). Returning to Missouri, Wyatt plans to study law with his grandfather, a judge, and to marry Urilla Sutherland. He succeeds in the second, only to see Urilla (Annabeth Gish), who is expecting their child, succumb to typhoid. Wyatt goes off the rails, and we next see him as a drunk, robbing a man and stealing a horse in Arkansas. Thown in jail, he is bailed out by his father, and he is next seen as a dour teetotaler, hunting buffalo on the southern plains, where he employs Ed (Bill Pullman) and Bat Masterson (Tom Sizemore) as skinners. When he takes care of a violent man the marshal won’t handle in Wichita, Wyatt is hired as a deputry. He develops a direct way of dealing with disorder and shows a talent for handling disorderly groups. Hired away as a deputy by Dodge City, he brings along the Masterson brothers and his own brother Morgan as deputies, too. Some think he’s too quick to bust a rule-breaker over the head, but he tells Ed that talking too much and being too affable can get a man killed. While on the outs with the Dodge City fathers, he meets John Holliday (Dennis Quaid) in Fort Griffin, Texas, and the two form a friendship. Then he is called back to Dodge because things have gotten out of hand without his firm approach. 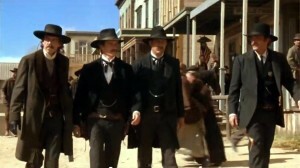 Bad guys hanging out in Tombstone. 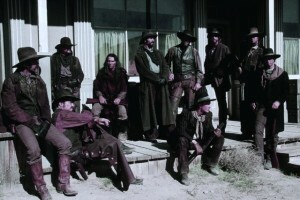 That’s Ike Clanton (Jeff Fahey) in the middle in the long duster. 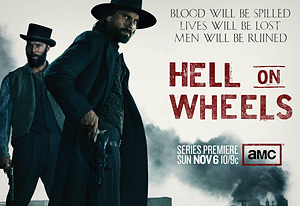 Eventually, Wyatt talks his brothers into moving to Tombstone, to get out of the law enforcement business and take up new opportunities in mining and gambling. He does this against the wishes of his brothers’ wives and quasi-wives. He himself brings along Mattie Blaylock (Mare Winningham), to whom he is not married. His older brother James’ wife Bessie (JoBeth Williams) is a prostitute, and Virgil’s wife Allie (Catherine O’Hara) is not fond of Wyatt’s influence in the family. Doc Holliday follows along, with his paramour Big Nose Kate Elder (Isabella Rosselini). 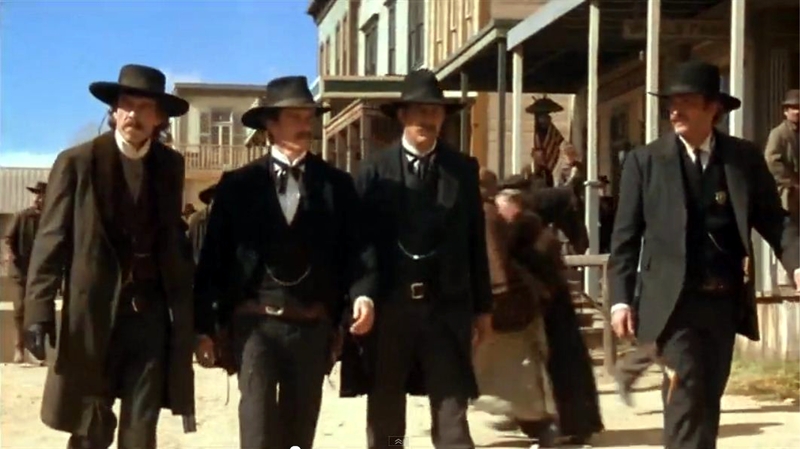 Heading to the OK Corral: Doc Holliday (Dennis Quaid), Morgan Earp (Linden Ashby), Wyatt Earp (Kevin Costner) and Virgil Earp (Michael Madsen). In Tombstone the film is finally entering familiar territory. The brothers acquire some mining and gambling interests, and Virgil signs up to be the town marshal when Fred White is killed by Curly Bill Brocius. This brings in three of the brothers, including Wyatt, and they begin to run afoul of the Clanton-McLaury faction and slippery Cochise Co. Sheriff Johnny Behan (Mark Harmon). Wyatt slips away from Mattie Blaylock and takes up with Behan’s young Jewish paramour, Josie Marcus (Joanna Going). While attempting to disarm the Clanton group, the famous gunfight erupts, with three Earps and Holliday taking on two Clantons, two McLaurys and Billy Claiborne. It ends with all of the Clanton group but Ike Clanton dead. In revenge, the Clanton group shoots Morgan Earp in the back with a shotgun blast, killing him, and on the same night bushwhacking Virgil as he does his rounds. (Those events actually happened three months apart.) Virgil’s arm is crippled. Wyatt takes his father’s words to heart, and the vendetta ride is on. Strangely for such a long movie, not so much of the vendetta ride is shown, just the killing of Frank Stilwell in the Tucson railroad station, the shooting of Indian Charlie and the fight at the river where Brocius is killed. The implication is that Ike Clanton and Johnny Ringo were both killed there as well, which was not the case. Neither Brocius nor Johnny Ringo is developed much as a character, making the end of the vendetta seem inconclusive. 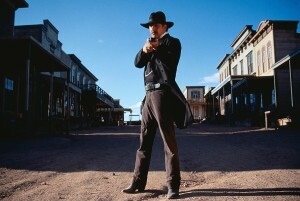 Doc’s death in a sanatarium in Colorado is not shown as it is in some cinematic versions of the story (Hour of the Gun, Tombstone). For the rest of Wyatt’s life, there is just one scene on a boat heading into Nome, Alaska, where a young man asks about Wyatt holding off a mob that wanted to lynch his uncle, Tommy Behind-the-Deuce. There is nothing about Wyatt’s subsequent career as a prospector, a prize-fight referee or even as an adviser on Hollywood westerns in the late 1920s. For such a long movie, there are a lot of loose ends remaining. Wyatt (Kevin Costner) taking back the streets. Costner and Quaid are very good in the two main roles of Wyatt and Doc. Unfortunately Costner isn’t as good as Henry Fonda (My Darling Clementine) or Kurt Russell (Tombstone), and Quaid is second to Val Kilmer (Tombstone) as a cinematic Doc Holliday. Quaid lost thirty pounds for this role, and he’s excellent, managing to convey a sense of meanness under the tubercular exterior. 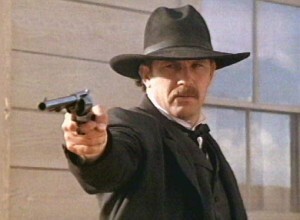 Costner shows the relentlessness and direct nature of Wyatt, but less the charisma and leadership. He makes Wyatt seem dour even when he takes up with Josie Marcus, and the part needs lifting somehow. Still, Costner has a flair for westerns, as he showed later in directing and starring in Open Range. The film has a huge cast, many of whom have worked with Kasdan before and many of whom are very good. Among the casting notes that don’t seem to work is Joanna Going as young Josie Marcus. She doesn’t have the dramatic heft to balance Wyatt, as the story seems to call for. Bill Pullman as Ed Masterson and Linden Ashby as Morgan Earp are good in smallish parts, and Mark Harmon is suitably distasteful as Johnny Behan. Among westerns strongly grounded in history, the Wyatt Earp story has generated an unusual proportion of good films and successful retellings: Frontier Marshal, My Darling Clementine, Gunfight at the OK Corral, Hour of the Gun and Tombstone. Although this is not the best of them (probably My Darling Clementine and Tombstone), it does belong in that excellent company. It keeps closer to the actual events than most, but don’t look for complete accuracy here, either. 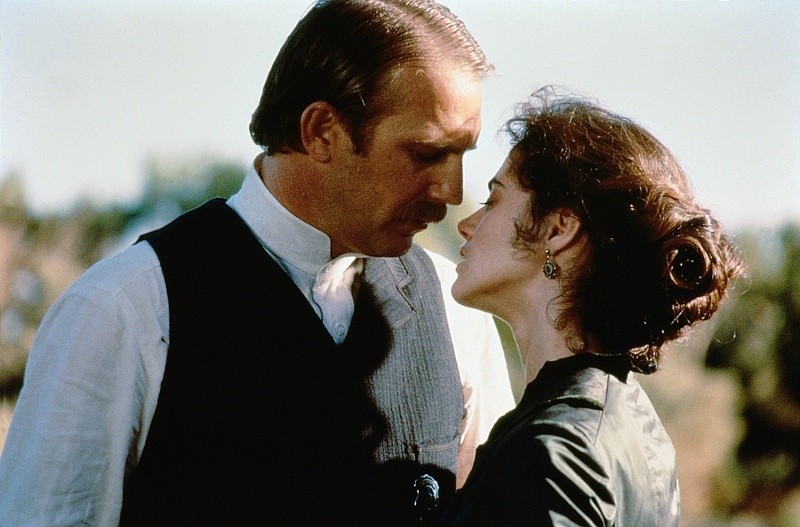 Wyatt (Kevin Costner) romances Josie (Joanna Going) in Tombstone. Much of what doesn’t work so well here probably has to be chalked up to Kasdan’s direction and editing. The cinematography by Owen Roizman is elegant, but it contributes to the slow moving of the first hour, with drifting shots of corn fields, flowering trees and extended plains. There is excellent music by James Newton Howard, but it feels in some ways like it lacks a western connection. The movie is more than three hours long at 191 minutes, although there is also an extended cut at 212 minutes. If you’re interested in the real history of the Earps, in addition to the sources cited elsewhere there is a recent biography of Josephine Marcus Earp, often referred to as Wyatt’s wife or common-law wife since there is no record of them having been married: Lady at the O.K. Corral by Ann Kirschner (2013). This entry was posted in Westerns Worth Watching and tagged Kevin Costner, Town Taming, Wyatt Earp on October 27, 2014 by Nicholas Chennault. Trapper Kit Carson and his men are attacked by Shoshones with Mexican guns near Fort Bridger, Wyoming, losing two years’ worth of pelts. The only survivors are Carson and his friends Ape (Ward Bond) and Lopez (Harold Huber). As they straggle into Fort Bridger, they find waiting for them a platoon of soldiers under Capt. 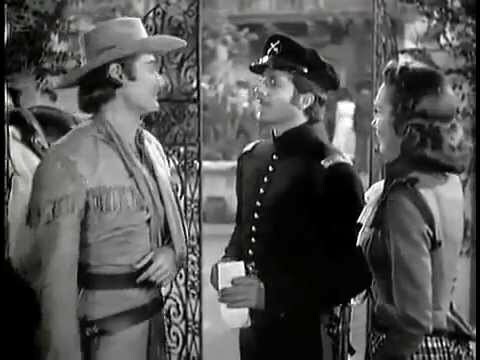 John C. Fremont (Dana Andrews) and a wagon train for California led by Paul Terry (Clayton Moore), both of whom want Carson to guide them to California. Carson refuses until he meets Dolores Murphy, a wealthy and attractive California heiress returning home. Then he signs up as wagonmaster. Carson has continual disagreements with Fremont as to how to go about things as they move westward, and Carson keeps finding evidence that the Mexican army in California is providing guns to the Shoshones to keep Americans out. Both Fremont and Carson are interested in Dolores Murphy, too. As they approach the Sierra Nevadas, Fremont wants to take the direct pass into California; Carson warns that it leads into an area that would make for a good ambush and advises a route 60 miles longer, but safer. Lopez (Harold Huber), Ape (Ward Bond) and Carson (Jon Hall) ride. Fremont doesn’t listen, and his platoon ends up boxed in by a Shoshone-triggered landslide. While the wagon train is under attack, too, Paul Terry sacrifices himself to warn Carson, and Carson rescues the soldiers by blasting them out with a wagon-load of gunpowder. 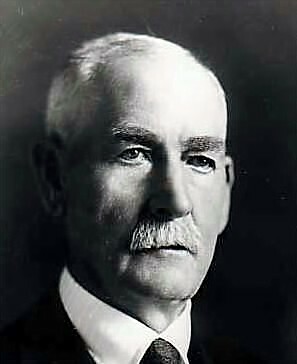 Once everybody is in California at the Murphy hacienda, Gen. Castro (C. Henry Gordon) decides to attack the American haciendas while their owners are attending a fiesta at Murphy’s. Mexican Gen. Mariano Vallejo (Lew Merrill) is captured and tips off Carson, who rides to warn the Americans. Vallejo switches sides, as he realizes that Castro has it in for him, too. Meanwhile, Carson decides he has no suitable life to offer a woman and leaves Dolores for Fremont to marry. While Carson, Ape and Lopez put up a mock defense of the Murphy hacienda against Castro, Fremont and Murphy attack Castro from the rear and defeat him. They set up the Bear Flag Republic and receive word that the U.S. and California are at war, making this about 1846. Ape is killed in the Mexican attack while setting off an explosive signal, and Fremont talks Carson (apparently) into the realization that Dolores can only be happy with Carson. Carson (Jon Hall), Fremont (Dana Andrews) and Dolores Murphy (Lynn Bari) talk things out. This film makes a hash of both geography and history. Carson started working for Fremont as a guide in the 1842 when the fur-trapping was dying out, guiding him on four expeditions in California and the Great Basin. While they were both in California while it was breaking away from Mexico during the Mexican War, they were on opposite ends of the state. Carson was working as a courier and guide for Gen. Stephen Kearney across the southwest border to San Diego. Fremont was rather famously married at the time, to Jessie Benton, daughter of the expansionist Sen. Thomas Hart Benton of Missouri. It was the writing and promotion of Jessie Benton Fremont that made her husband famous, in fact. Kit Carson was married at least three times beginning in 1835, to an Arapaho woman, a Cheyenne woman and finally to Josefa Jaramillo in Taos, New Mexico, in 1843. 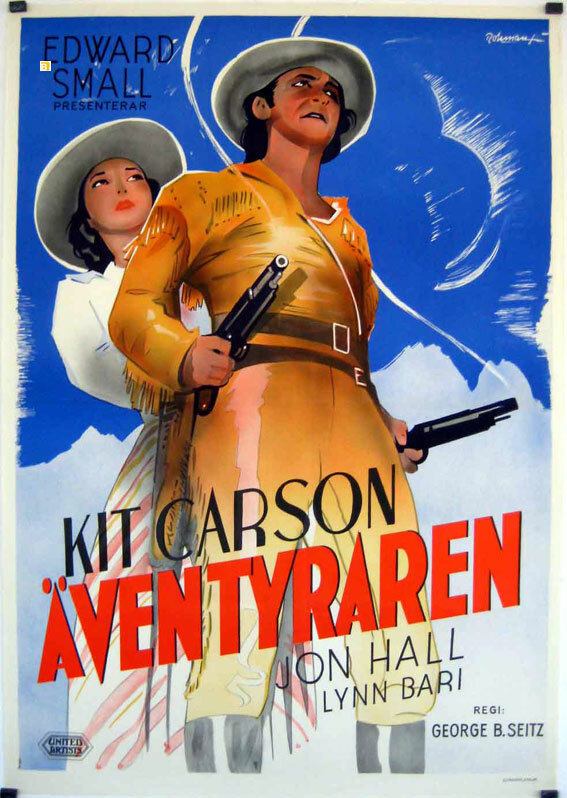 This is one of the early films to make use of Monument Valley and southern Utah, the year after John Ford made Stagecoach there. Although stunning, it doesn’t really look much like the country around Fort Bridger or California. Aside from Ward Bond as Ape (who strangely uses a boomerang several times), none of the cast was much associated with westerns. Half-Tahitian actor Jon Hall is better remembered for such exotic fare as Hurricane, although he would show up again in a 1947 remake of Last of the Mohicans (entitled Last of the Redmen). Dana Andrews had a small parts in The Westerner, Belle Starr and The Ox-Bow Incident (he was the subject of a lynching) about this time, and he returned briefly to westerns in the 1950s (see Three Hours to Kill, Strange Lady in Town and Comanche, for example). Geronimo’s grandson Charles Stevens (as Charley Stevens) has one of his juicier parts as Lt. Ruiz, who is working directly with the Shoshones. Clayton Moore went on to his greatest fame as television’s Lone Ranger a decade later, and Mohawk actor Jay Silverheels (later Tonto) has an uncredited bit part here, too. Director George B. Seitz was coming to the end of a long career and is better remembered for making several Andy Hardy movies about this time. 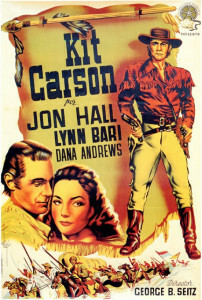 Jon Hall as Kit Carson; and the real Kit Carson. If you’d like to read about the historical Kit Carson, see Hampton Sides’ recent Blood and Thunder: An Epic of the American West (2006). 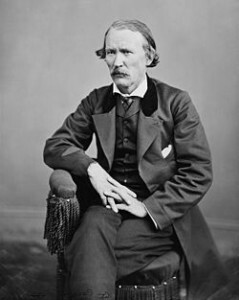 Kit Carson had been the subject of popular attention beginning with dime novels in the 1840s. He showed up in movies beginning with an early short in 1903, and would move into television in the 1950s. In black and white, at 97 minutes. This entry was posted in More Westerns and tagged Dana Andrews, Kit Carson, Native Americans (Indians), Wagon Trains, Ward Bond on October 24, 2014 by Nicholas Chennault. 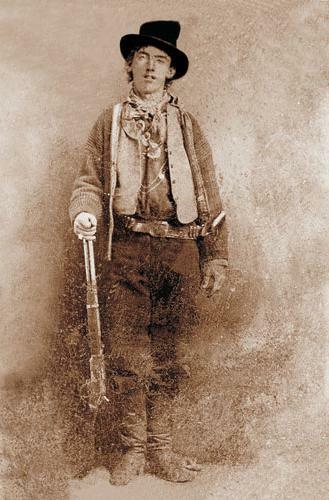 It is hard to explain the continuing notoriety and charisma, even popularity, of youthful New Mexico outlaw William Bonney—Billy the Kid. Young, wild and illiterate, he was only 21 when he was killed by Sheriff Pat Garrett in a darkened room; he was said to have killed a man for each year of his life, although the real total seems likely to be less than that. Jesse James had an extended period of successful outlawry and a genius for public relations in his letters to Kansas City and other Missouri newspapers. Butch Cassidy had a magnetic personality and a modern-day Robin Hood streak, and was never known actually to shoot anyone before heading for South America. 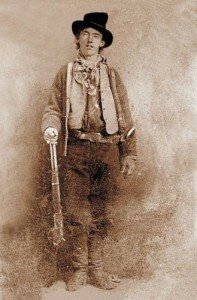 Billy, caught up in New Mexico’s Lincoln County War, was a killer. One sees various photographs on the internet said to be of Billy, but there is only one that is known to be an authentic image. 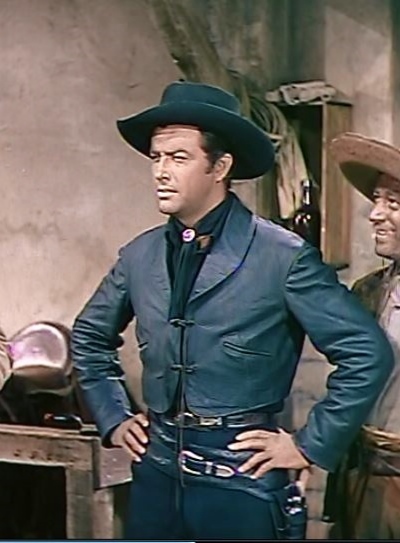 The authentic scruffy-looking William Bonney (Billy the Kid); and a much smoother (and older) leather-clad cinematic Billy–Robert Taylor in 1941. The Kid showed up in movies a little later than Jesse James did, beginning around 1930, when he had been dead almost 50 years. He was especially prominent in the early 1940s, in a series of B movies with Bob Steele and Buster Crabbe. Billy has been played by such cowboy stars as Johnny Mack Brown, Roy Rogers, Bob Steele and Audie Murphy, as well as bigger mainstream stars like Robert Taylor and Paul Newman. Like many prominent western figures, Billy has been subjected to revisionist treatment (see Dirty Little Billy, 1972) in the movies. 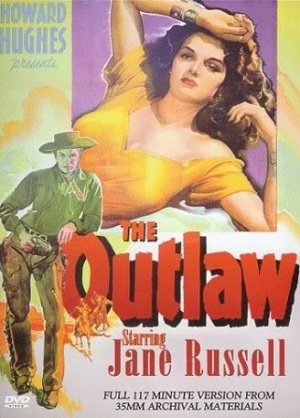 The most notorious movie about Billy may have been Howard Hughes’ The Outlaw, in which the most prominent character was not Billy, but fictitious romantic interest Rio, played by Jane Russell. 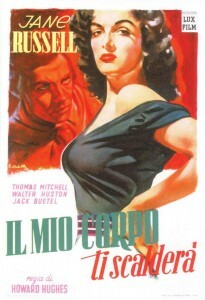 Certainly Russell figured more prominently on the posters. 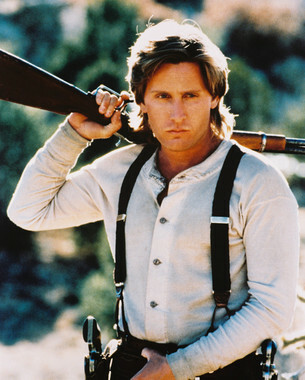 Billy had a cinematic resurgence about 25 years ago, in the two Young Guns movies, in which he was played by Emilio Estevez. There are a number of biographies and other works on the historical Billy. For historical reliability, you might start with Robert Utley’s Billy the Kid: A Short and Violent Life (1991) and High Noon in Lincoln: Violence on the Western Frontier (1990). For readability, try Billy the Kid: The Endless Ride, by Michael Wallis (2007). 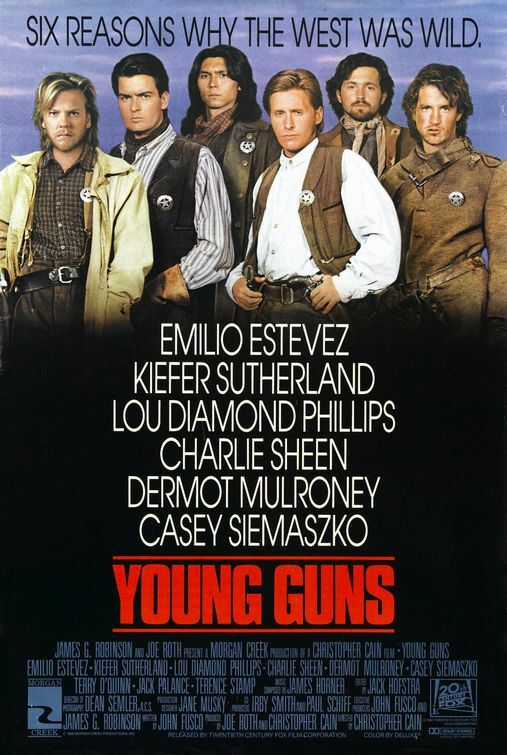 Billy the Kid for a new generation: Young Guns, 1988; and Emilio Estevez as Billy. This entry was posted in Lists and tagged Billy the Kid on October 22, 2014 by Nicholas Chennault. Despite the name, this is not a mining western but a railroading western. (Carson City and Virginia City were in the heart of the fabled Comstock Lode silver-mining country.) It is not the very best work in the genre by one-eyed Hungarian director Andre de Toth (see Ramrod and Day of the Outlaw) or by star Randolph Scott during the early 1950s (see maybe Hangman’s Knot), but it is an above-average western with a reputable star and director. 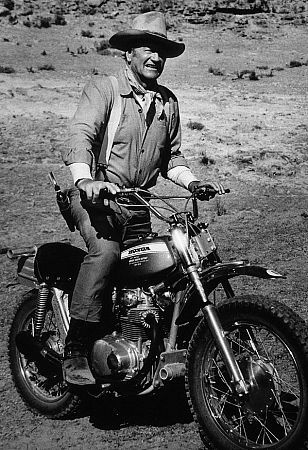 Silent Jeff Kincaid (a not-so-silent Randolph Scott) has developed a reputation as a railroad construction engineer able to deal with tough terrain. San Francisco banker William Sharon (Larry Keating) wants to build a railroad line in the mountains between between Virginia City and Carson City on the Nevada side of the Sierra Nevada range. Kincaid knows the territory well because he grew up there. His half brother Alan is still there, although Kincaid hasn’t been back in a dozen years or more. 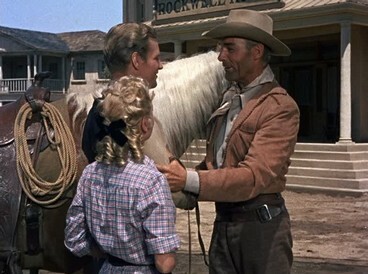 The brothers (Richard Webb, Randolph Scott) meet, along with the newspaper publisher’s daughter (Lucille Norman). As Kincaid rides back into town, he is greeted by Susan Mitchell (Lucille Norman), daughter of the local newspaper publisher. She was only thirteen when Jeff left town, but she had a crush on him. Working with the Mitchells is brother Alan Kincaid (Richard Webb), who has a relationship of sorts with Susan. Banker Sharon wants the new line to avoid bandits who’ve been robbing stages, but newspaperman Mitchell and most of the rest of the town like it the way it is and don’t want the riotous changes railroaders will bring. The bandits are led by mine owner Big Jack Davis (Raymond Massey), whose mine is played out, and by his henchman Squires (James Millican). They try to sabotage the new line at every turn, smashing up a wagon load of equipment and killing the driver, then engineering a landslide that kills three others and traps Kincaid and several others in a blocked tunnel. They are rescued by a joint town-railroad effort that punches through the tunnel from the other side. Davis kills Susan’s father when he thinks he knows too much. Some suspect Kincaid of having had a hand in Mitchell’s murder to silence opposition, and Susan isn’t sure. Alan becomes hostile because he thinks Susan is becoming too fond of Jeff. Kincaid (Randolph Scott) rescues Susan (Lucille Norman) from a railroad-building blast. On the line’s opening run, there is a big celebration, but Davis plans to rob the train as it returns from Virginia City to Carson City. Jeff gets wind of these plans and rides with miners to the site of the robbery. As Davis and Squires are getting away with the gold bullion, Davis shoots Squires in the back and heads into the rocks. In an extended shootout, Alan is killed but Jeff gets Davis. In the end, it looks like Jeff gets Susan and is about to be talked into taking on the building of another tricky line of railroad. Most of Randolph Scott’s westerns in the early 1950s were made for Columbia and Warner Bros. They tended to be made with comparatively low budgets, and this showed up principally in the writing, the hiring of the director and the supporting players. Here the director is better than in most, but the weaknesses are in the supporting cast. Raymond Massey could usually do a pretty juicy villain pretending to respectability (see Dallas, for example), and he does it well here. But Richard Webb, playing blond brother Alan, is not very memorable, nor is Warners starlet Lucille Norman—another in a string of forgettable romantic interests in Scott westerns. 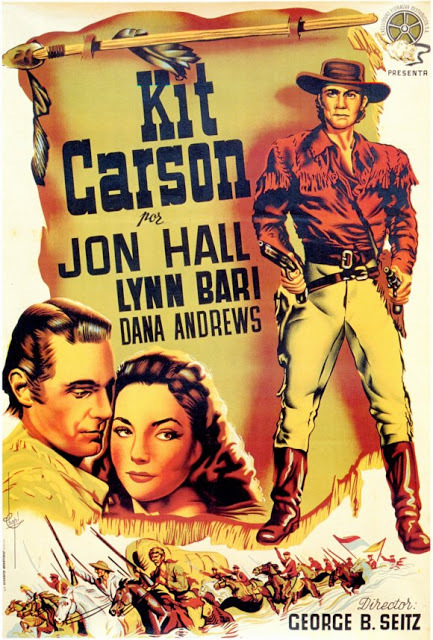 The assumption seems to be that if Jeff Kincaid left Carson City twelve years ago, maybe he’s about 35 years old; but Randolph Scott, although he is aging very well, is closer to 55. That’s about 30 years older than Lucille Norman. During the shootout in the rocks, the figure in black leaping around the rocks with great agility is clearly not a Randolph Scott in his mid-fifties. One co-star worth looking for: Scott’s beautiful dark palomino Stardust. With those grumbles, this film moves right along, and if you’re a Randolph Scott fan, it’s worth watching. 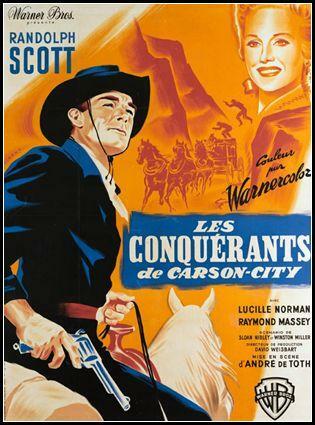 This is the second of six Randolph Scott westerns directed by Andre de Toth. After two or three more years and four more westerns, De Toth would tire of the restrictions of low budgets and other frustrations that came with Scott westerns, and would decide to make no more of them. But this is a pretty good one. 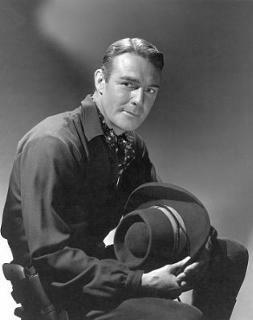 According to Robert Knott, author of The Films of Randolph Scott, it is “the absolute best Warner Bros. Scott western of the period.” (Hangman’s Knot was a Columbia production.) In color, at 86 minutes. 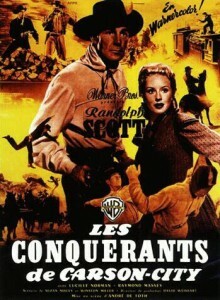 This entry was posted in Westerns Worth Watching and tagged Andre de Toth, Randolph Scott, Train Robbing, Trains on October 20, 2014 by Nicholas Chennault. A.J. 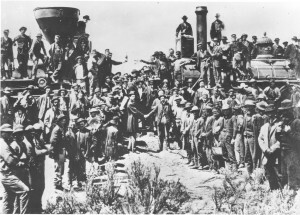 Russell’s famous photograph of the driving of the golden spike on completion of the transcontinental railroad at Promontory, Utah, in 1869. This is the second of two posts on technology as depicted in westerns. The previous post described in general terms how westerns have treated the push westward of both population and such technologies as railroads and telegraphs during the 19th century. Now we get more specific, with lists of movies in which such technologies and business form a significant element. As always the lists below have likely left out some examples. If you can think of others that belong, leave a comment. 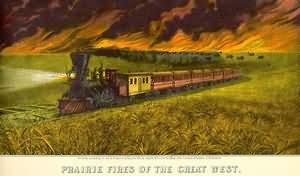 1871 print by Currier & Ives, featuring “Prairie Fires of the Great West.” And what would a prairie fire be without a train? 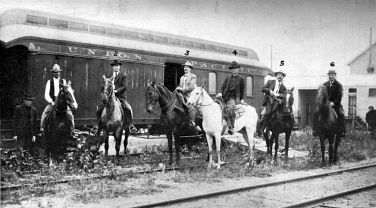 The special posse led by lawman Joe LeFors that set out after Butch Cassidy and the Wild Bunch after their train robbery at Tipton, Wyoming, on August 29, 1900. It didn’t catch them. 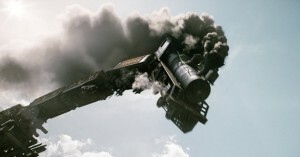 One of the three train crashes in The Lone Ranger, 2013. Hackman and Coburn are forced to use modern technology in Bite the Bullet. John Wayne and an unusual steed in 1970, when he was filming Big Jake, a western set in 1909. A steampunk Kenneth Branagh in The Wild, Wild West, 1999. This entry was posted in Lists and tagged Technological Westerns, Train Robbing, Trains on October 17, 2014 by Nicholas Chennault. 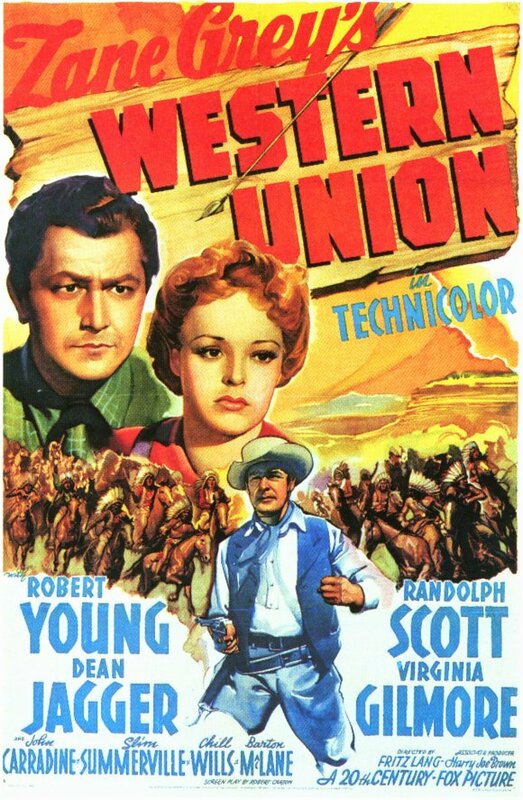 Beginning in the 1920s, only a generation after historian Frederick Jackson Turner had pronounced the frontier closed, the westward movement of the nation and its accompanying development of technology found their way into the movies in epic form. 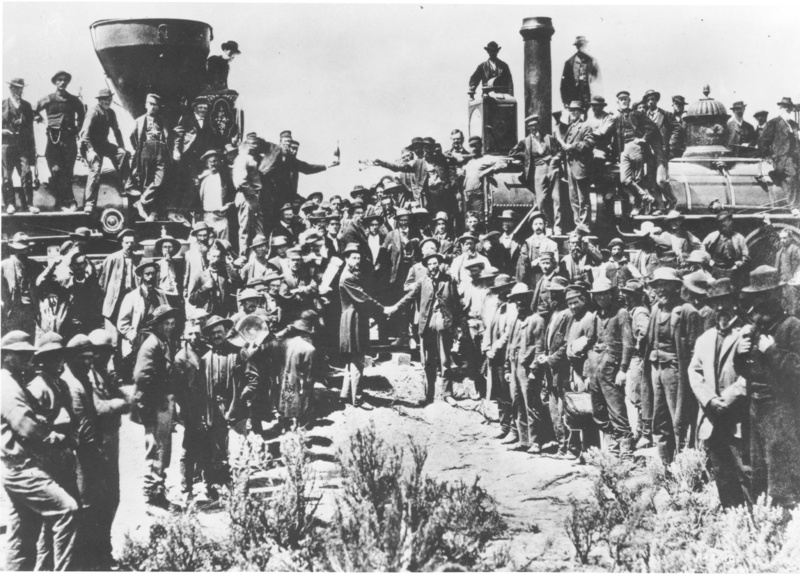 After all, there were still people living who could remember the joining of the transcontinental railroad at Promontory, Utah, in 1869. To most of them, the concurrent triumphs of 19th-century technology and westward movement of the population represented the fulfillment of the nation’s Manifest Destiny, a phrase used in its politics since at least the 1840s. Many of those making the movies had family who could remember participating in what the movies depicted. 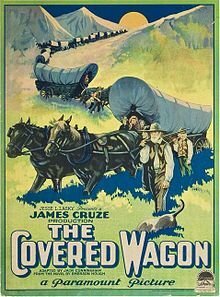 One of the reasons director James Cruze was drawn to the story of westward expansion in The Covered Wagon (1923) was that he was the son of Mormon immigrants and had grown up on such stories. 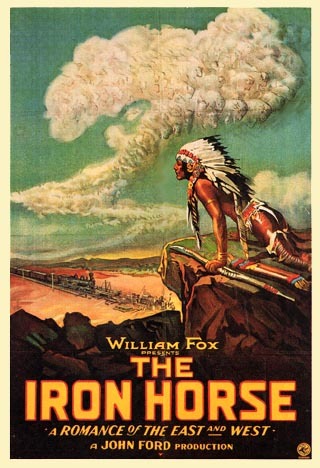 The next year, John Ford told the story of the railroad in The Iron Horse, another epic of the silent era. Both were great successes at the box office, and as the movies grew, so did the productions depicting western expansion and technology. The most obvious such technology was the railroad, but other expansion-related technologies and businesses found their way into the movies: the telegraph, Wells Fargo, the Pony Express and such. The course of expansion was seldom smooth, and westerns tended to show expansion as an unmitigated good thing, representing progress. Of course, trains no sooner entered new parts of the country than they found themselves the object of attention from outlaws. 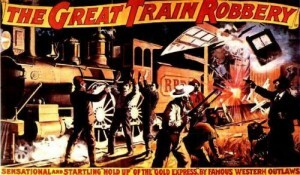 Jesse James made a large part of his reputation robbing trains, and one of the first notable American-made movies was Edwin Porter’s 1903 The Great Train Robbery, which is better known today than just about any other movie of its time. And it is used in The Grey Fox as an inspiration to former stagecoach bandit Bill Miner as he tries to figure out what’s next for him in his outlaw career. 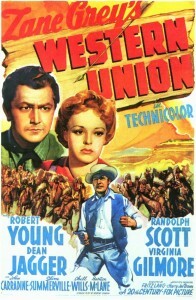 In general railroad builders were seen as admirable, and the troubleshooters who solved problems and dealt with Indians and outlaws were the heroes of westerns, representing the forces of good and progress (Joel McCrea in Union Pacific, Randolph Scott in Western Union, Alan Ladd in Whispering Smith, James Stewart in Night Passage, etc.). That lasted through the 1950s. 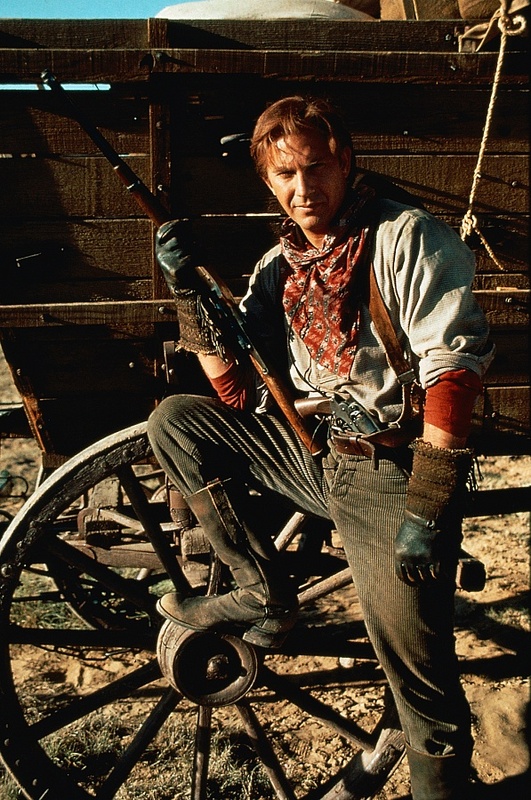 The last large-scale triumphalist view of railroads in a western was probably in 1962, in How the West Was Won, with George Peppard as the railroad builder and troubleshooter. As the decades passed, the post–World War II generation (the Baby Boomers) began to question authority and the motives of those who had been in charge of businesses and technologies during the westward movement. Big business came to be seen an a tool for villainy, and in westerns, those in charge of the railroads began to be depicted as greedy and corrupt, beginning in the late 1960s with such movies as Sergio Leone’s magnum opus Once Upon a Time in the West. Nefarious railroads and their tactics out west had long been present in such literary works as Frank Norris’ The Octopus. But that view became more common in westerns in the 1970s. By our time, 150 years after the completion of the transcontinental railroad, those who built and operated railroads in the west are routinely depicted as downright conspiratorial, despising individual rights and subverting government. The evil railroad baron has become a cliché, like the moustache-twirling, top-hatted villains of the early serials. 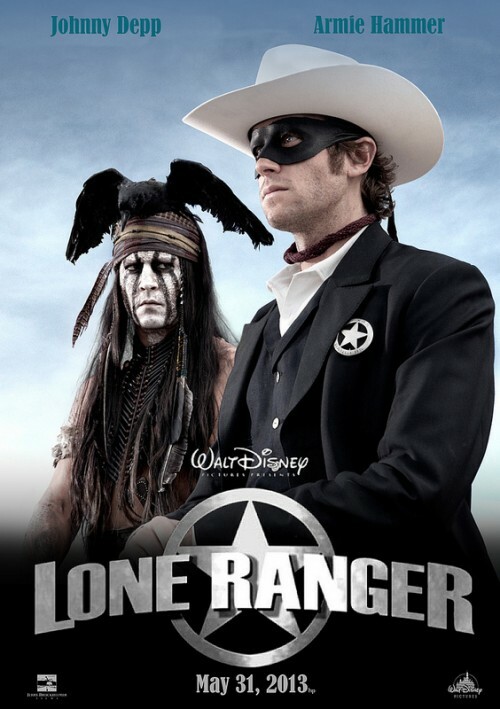 For a recent example, see Tom Wilkinson in 2013’s The Lone Ranger. 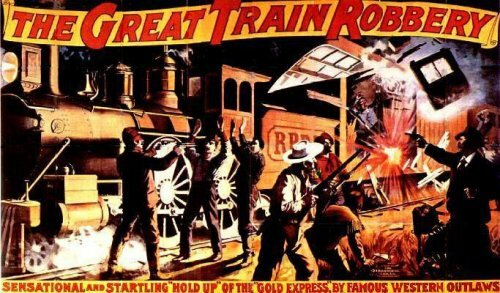 The development of another technology—the use of computer-generated graphics in films—has meant that such flamboyant disasters as train crashes have also become much more common in movies, including westerns. 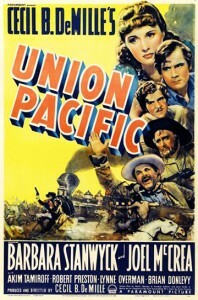 When Cecil B. DeMille, who seemed to love train crashes, had two of them in his 1939 epic Union Pacific, he could only do that with a huge budget for his time. Now, if a train shows up as a significant element in a western, it is likely to be wrecked before the movie is done. 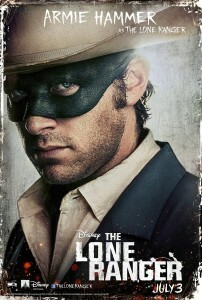 The recent The Lone Ranger broke DeMille’s record with three train wrecks, all computer-generated. By the 1960s, there was a new sort of western in which a significant element of the story was the passing of the old west (Ride the High Country, The Shootist, Big Jake, etc.) and the obsolescence of the lone man with a gun as his own law. In these, even newer technologies appeared: automobiles, motorcycles, and fancier guns, for example. 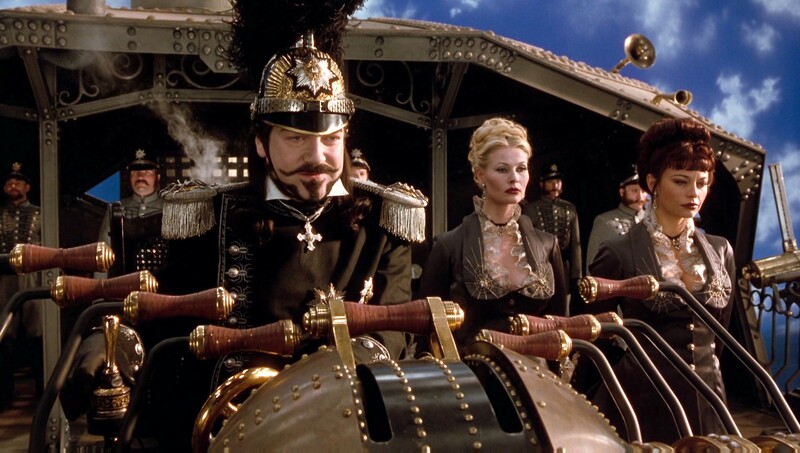 And with the popularity of steampunk as a genre in literature and movies, elements of steampunk technology have crept into more fanciful westerns (The Wild Wild West, Jonah Hex and Cowboys & Aliens, for example). This is the first of two posts on technology and westerns. In our next post, see more extensive lists of movies with technological themes, most involving railroads and railroading. This entry was posted in Lists and tagged Technological Westerns, Trains on October 15, 2014 by Nicholas Chennault. The Lone Ranger has not done well in the movies. First, he showed up in inexpensive serials. 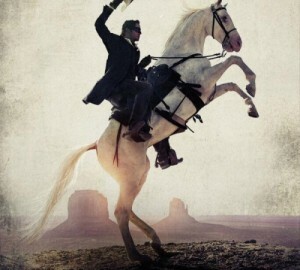 Then, after a good career in radio and television, he was caught up in the nostalgia for television in the movie studios, resulting in The Legend of The Lone Ranger (1981), featuring the immortal Klinton Spilsbury in his only movie role. Now, in 2013, the Ranger was again brought to the big screen, this time by director Gore Verbinski, and no expense was spared, with big stars (Johnny Depp and Armie Hammer), a big budget, lots of action and many expensive CGI effects. The film does not feature a story so much as various vignettes and action pieces strung together for a lengthy 149 minutes. It opens with an unnecessary framing story from San Francisco in 1933. A small boy dressed as the Lone Ranger (complete with mask) steps into a Wild West tent at a carnival (the Golden Gate International Exposition on Treasure Island wasn’t until 1939, but that’s the sort of event it seems to be), where a tableau showing an aged Indian comes alive. 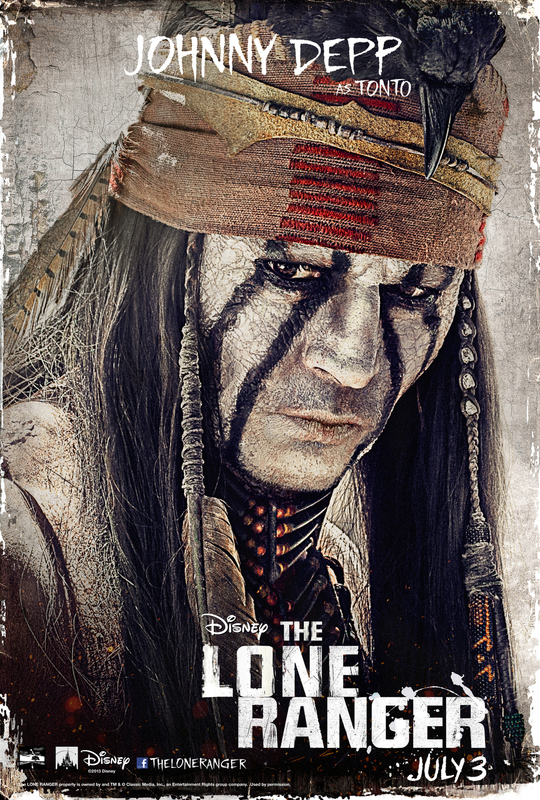 It is Tonto (Johnny Depp), who proceeds to regale the lad with the story of his adventures with the Lone Ranger. Tonto and Butch Cavendish (William Fichtner) are chained in a railroad freight car heading for Colby, Texas, in 1869 as the transcontinental railroad nears completion. Some one has put a gun in the floorboards so Cavendish can escape when his gang robs the train. John Reid (Armie Hammer), newly graduated from law school in the east and now appointed the Colby County prosecutor, ineffectively tries to stop the escape and robbery, but only ends up chained to Tonto himself. The Cavendish gang has killed the engineers and set the locomotive to increase speed as it heads toward the end of the track. William Fichtner in heavy makeup as the wendigo Butch Cavendish. Texas Ranger Dan Reid (James Badge Dale) rides up with his five men and succeeds in disconnecting the locomotive from the passenger cars, but Tonto and John manage to survive flying off the train at full speed as the train crashes. John puts Tonto in jail (accused of being an Indian, apparently) and renews an acquaintance with Dan’s wife Rebecca (English actress Ruth Wilson), and she appears to have a thing for him. 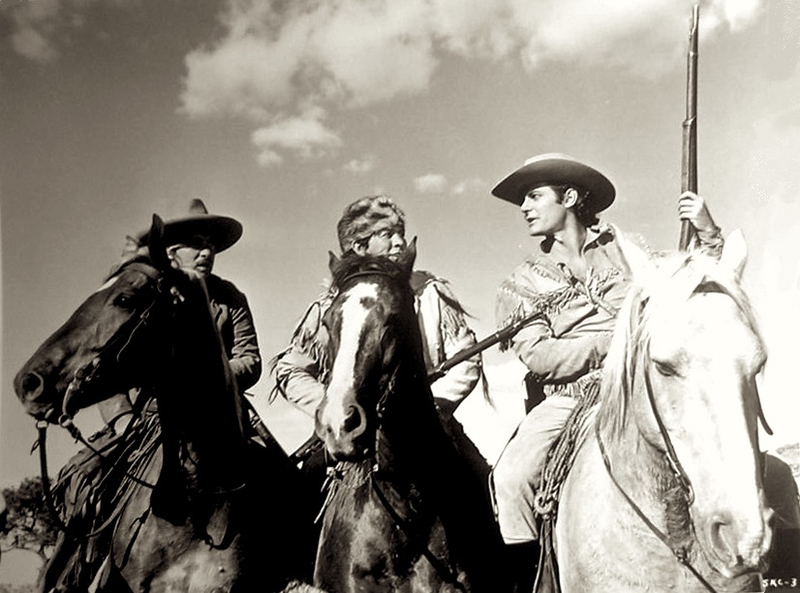 Dan and John and the other rangers head off after Butch Cavendish and are led into an ambush by the drunken Collins, who has known them both since childhood. All are apparently killed and Cavendish eats Dan’s heart. Tonto comes upon the scene and buries the Rangers, only to discover that John is not dead. John is chosen by a white spirit horse to come back to life, against Tonto’s advice that the other brother would do better. Indeed, he explains a bit later to John that “Kemo Sabe” means “wrong brother,” kind of a running joke. John dons a mask made from Dan’s vest, with bullet holes where he was shot forming the eye holes. Experienced Ranger Dan Reid (James Badge Dale) offers his brother John (Armie Hammer) a gun. The two go to Red’s (a combination bar and wild whorehouse) in search of information on Cavendish or Collins, in a picaresque but unnecessary sequence. Red (Helena Bonham Carter), a former dancer with an ivory artificial leg, seems inclined to help but gives no real information. They make their escape and hear that Comanches are raiding ranches and farms, and they head for Dan Reid’s place. The Comanches are actually Cavendish’s gang dressed as Indians (sort of); John kills the remaining two while supposedly firing a warning shot, and they follow one outlaw’s horse into the desert, where the horse keels over dead. They are found by Comanches led by Big Bear (Saginaw Grant), and John tells what he knows of Cavendish and his plans. But Tonto has no credibility among his own people, since he showed two white men where to find silver (“where the river begins”) twenty or thirty years ago, leading to the killing of most of his band. The Comanches leave John and Tonto buried up to their heads, and the cavalry races over the top of them without bothering to stop. The spirit horse pulls John out, and he in turn gets Tonto out to show him where the river begins. There are a number of railroad cars laden with silver, and John and Tonto find Cavendish there. Tonto (Johnny Depp) consults the spirit horse, while a disheveled John Reid (Armie Hammer) looks on. John is taken and about to be executed by a military firing squad, when a train comes between him and his executioners in one of the split-second maneuvers typical of this movie. The cavalry, led by a long-haired Custer-like captain (Barry Pepper) slaughters the Comanches when they attack. John and Tonto attempt to blow up a high railroad trestle, for no obvious reason. Meanwhile, evil railroad baron Latham Cole (Tom Wilkinson) has kidnapped Rebecca and Danny, intending them to be his new family. In the movie’s most egregious geographical misplacement, the transcontinental railroad is joined at Promontory Summit—in Texas, not Utah. As part of the festivities, Cole is taking over control of the railroad; he and Cavendish are partners, and have been ever since the child Tonto led them to the silver decades ago. A chase of two trains follows, with the Lone Ranger riding the spirit horse along the top of one of them, diving to a flat car just as a tunnel comes up. 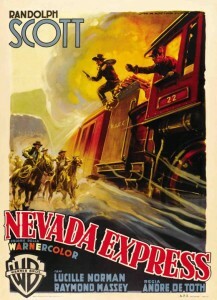 Both trains wreck, Butch Cavendish and the long-haired captain are killed, and Cole rides the silver cars over the blown-up trestle to his doom. 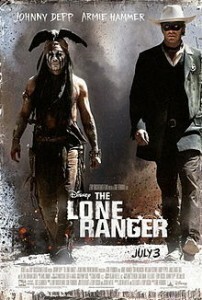 The Lone Ranger and Tonto ride off to right other wrongs, instead of John Reid settling down with his brother’s family. The last Ranger heads into action. If this summary sounds like kind of a hash, the movie’s plot is. Johnny Depp’s performance is strongly reminiscent of his shtick as Captain Jack Sparrow in the four (so far) Pirates of the Caribbean movies, not coincidentally also directed by Gore Verbinski. 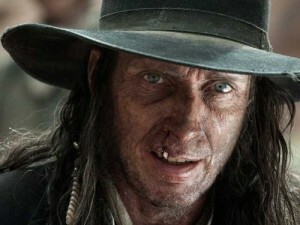 Depp’s makeup is obviously based on a famous painting by western artist James Bama. John Reid, the Lone Ranger (played by Armie Hammer), is played as a doofus; by the end of the movie, he is simply a more experienced doofus. Things seem to be set up for perhaps a sequel, but the movie was not a big hit. In fact, by some accounts it forced Disney to take a $190 million write-down on its books. Some performances stand out enough to recognize that a couple of good actors were wasted in what they were given to do here. James Badge Dale is good as the Ranger brother Dan Reid, and his character is killed off early. Ruth Wilson, so good as Jane Eyre in the much more coherent BBC production (2006), is here whipsawed back and forth without any consistent motivation. The supposed John Reid-Rebecca Reid infatuation doesn’t work. William Fichtner, who can be effective with more restraint and less makeup, is too over-the-top filthy and evil as the wendigo (kind of an Indian vampire creature) Butch Cavendish. Tom Wilkinson can play this clichéd corrupt railroad baron in his sleep, and does. This could be much longer if we went into the various geographic and historical anomalies and anachronisms in which this film abounds. There is lots of borrowing from other westerns, such as the cross-dressing outlaw in the Cavendish gang (see Dead Man for the first such example of that), the use of a cannibalistic wendigo (see Ravenous) and the long-haired blond bad-guy cavalry leader (see The Mask of Zorro). 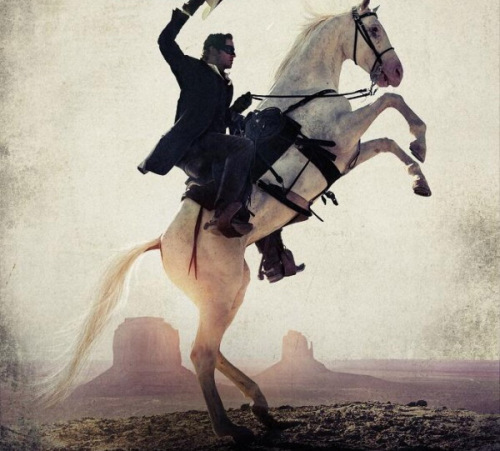 Overall, it’s not quite as bad as either The Wild, Wild West or the Klinton Spilsbury version of the Lone Ranger story from thirty years ago, but it’s not very good. Was anything good? 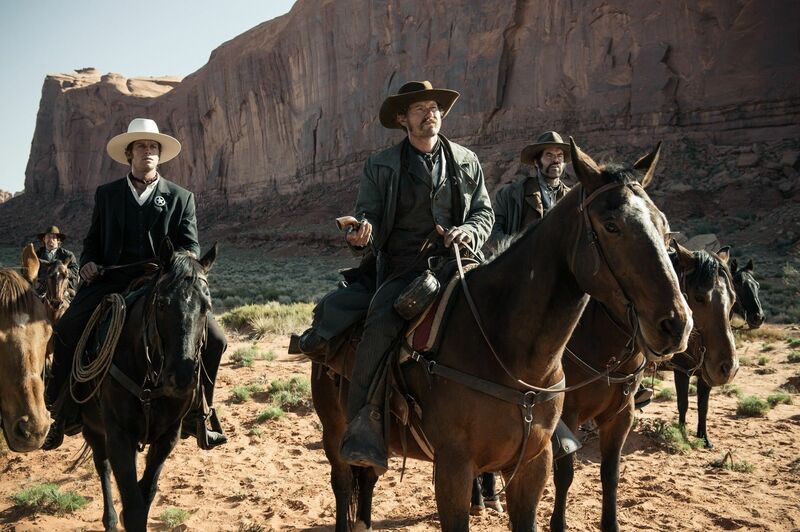 There is excellent cinematography (see the overhead shots of the Rangers heading up a creek into the canyon) and some of the best use of Monument Valley since John Ford started using it as a setting, including for both Texas (The Searchers) and Tombstone, Arizona (My Darling Clementine). As a comedy, it doesn’t work terribly well, largely because of insonsistencies in tone and characterization, as well as lack of a story. The stuntwork/CGI effects are over-the-top unbelievable from the start. 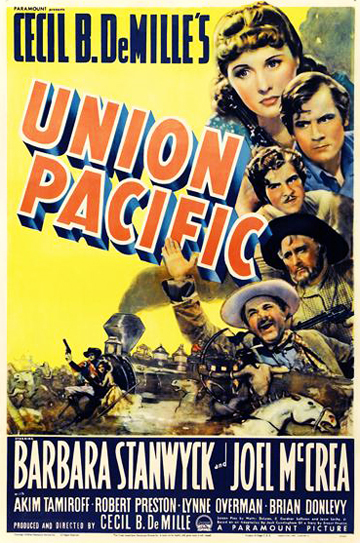 This film now holds the record for train crashes in a western with three, breaking the old record of two formerly held by Cecil B. DeMille for Union Pacific (1939). You can do that more easily now that you can crash them on computers and not actually have to smash up equipment. Director Gore Verbinski actually made one other western, and it’s better than this one: the animated feature Rango (2011). Johnny Depp is not a natural in westerns, but he too has made another one: Jim Jarmusch’s surrealistic Dead Man (1995). For a better fanciful western, see Cowboys & Aliens (2011). This entry was posted in More Westerns and tagged Native Americans (Indians), Outlaw Gangs, Television Nostalgia, Train Robbing, Trains on October 13, 2014 by Nicholas Chennault. Major Howell Brady (Jeff Chandler) is a war hero from the Civil War, now trying to recruit Seminoles in Texas to fight Kiowas led by Satanta (Jay Silverheels) and a mysterious white man. When he arrives at his new post, Fort Clark, he finds that his new superior, Col. Jackson Meade (John McIntire), is dubious about his enterprise. And he also finds a romantic interest in recent widow Elaine Corwin (Maureen O’Hara). Meade seems to be interested in her, too. 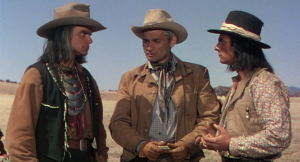 Brady succeeds in recruiting the reluctant Seminoles led by Maygro (Henry Brandon, the German actor who played Scar in The Searchers and Comanche chief Quanah Parker in Two Rode Together), but there are undercurrents. Meade is not supportive of the effort, even when it turns out to be quite successful. And Maygro’s daughter Avis (Suzan Ball) has adopted white values and is interested in Brady. The mysterious white man helping the Kiowas turns out to be the not-so-dead Corwin (James Bannon). The conflict between Brady and Meade over strategy and use of the Seminoles leads to Brady being tossed in the brig. 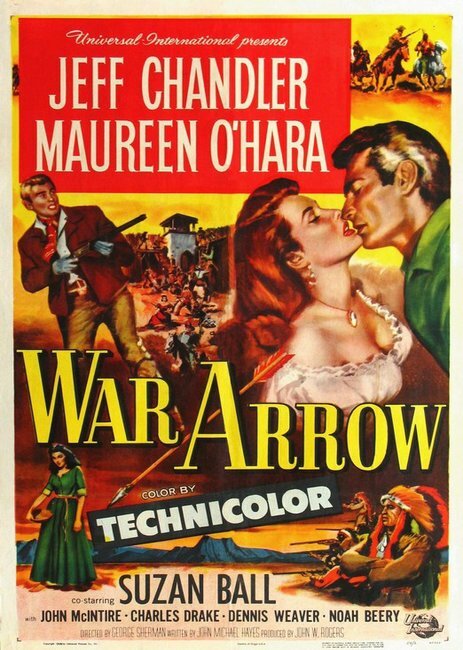 Major Howell Brady (Jeff Chandler) is interested in fiery young widow Elaine Corwin (Maureen O’Hara); adversaries Satanta (Jay Silverheels) and Brady (Chandler), not so hostile behind the scenes. He nevertheless manages to save the post from destruction, and Corwin and Satanta are killed. Meade is wounded and, of course, comes to a new appreciation of Brady—as does the now-widowed Corwin. Avis turns her attentions to Seminole warrior Pico (Dennis Weaver). The Corwin character is not very fleshed out, and the end, with Meade’s immediate conversion, doesn’t seem entirely believable. The final battle at the post is not well done. But this is fairly watchable anyway. Shot in color by William Daniels (The Far Country, Night Passage), at only 78 minutes. Major Brady makes plans with allies Maygro (Henry Brandon) and Pico (Dennis Weaver). 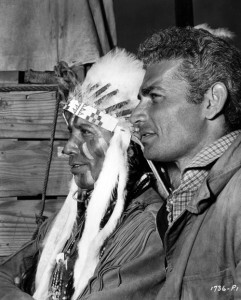 For another movie of Jeff Chandler commanding cavalry out west and fighting Kiowas, see Two Flags West. In that one, he plays the unreasonable commander rather than the fighting hero. But it’s a good movie. 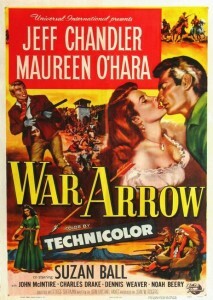 Chandler and Silverheels had played Cochise and Geronimo, respectively, in Broken Arrow, another good western, which had made Chandler’s reputation. Dennis Weaver shows up again as an Indian, this time a Navajo, the same year (1953) in Column South, an Audie Murphy movie. 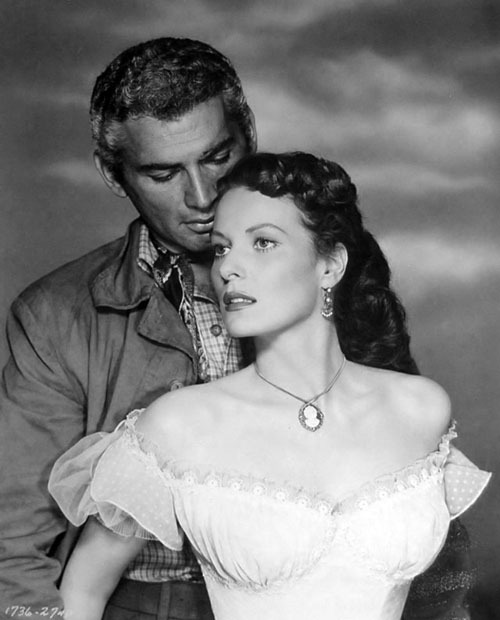 This entry was posted in Westerns Worth Watching and tagged Cavalry Westerns, Jeff Chandler, Maureen O'Hara, Native Americans (Indians) on October 8, 2014 by Nicholas Chennault.